tl;dr See this movie visualization for a case study on how a post propagates through Quora. 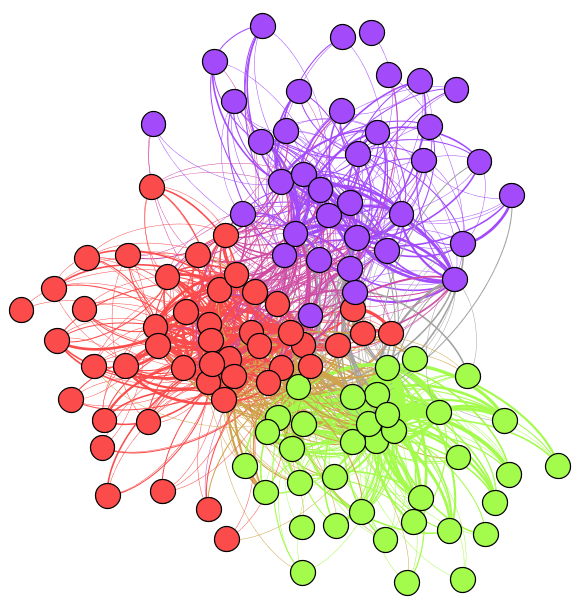 How does information spread through a network? Much of Quora’s appeal, after all, lies in its social graph – and when you’ve got a network of users, all broadcasting their activities to their neighbors, information can cascade in multiple ways. How do these social designs affect which users see what? Think, for example, of what happens when your kid learns a new slang word at school. He doesn’t confine his use of the word to McKinley Elementary’s particular boundaries, between the times of 9-3pm – he introduces it to his friends from other schools at soccer practice as well. A couple months later, he even says it at home for the first time; you like the word so much, you then start using it at work. Eventually, Justin Bieber uses the word in a song, at which point the word’s popularity really starts to explode. To give an initial answer to some of these questions, I dug into one of my more popular posts, on a layman’s introduction to random forests. Before looking deeper into the voting dynamics of the post, let’s first get some background on what kinds of users the answer reached. A large group in green centered around a lot of power users and Quora employees. A machine learning group of folks in orange centered around people like Oliver Grisel, Christian Langreiter, and Joseph Turian. A group of people following me, in purple. The orange cluster of users is more heavily into machine learning: 79% of users in that cluster follow more green topics (machine learning and technical topics) than red and purple topics (startups and general intellectual matters). The green cluster of users is reversed: 77% of users follow more of the red and purple clusters of topics (on startups and general intellectual matters) than machine learning and technical topics. More interestingly, though, we can ask: how do the connections between upvoters relate to the way the post spread? So let’s take a look. Here’s a visualization I made of upvotes on my answer across time (click here for a larger view). 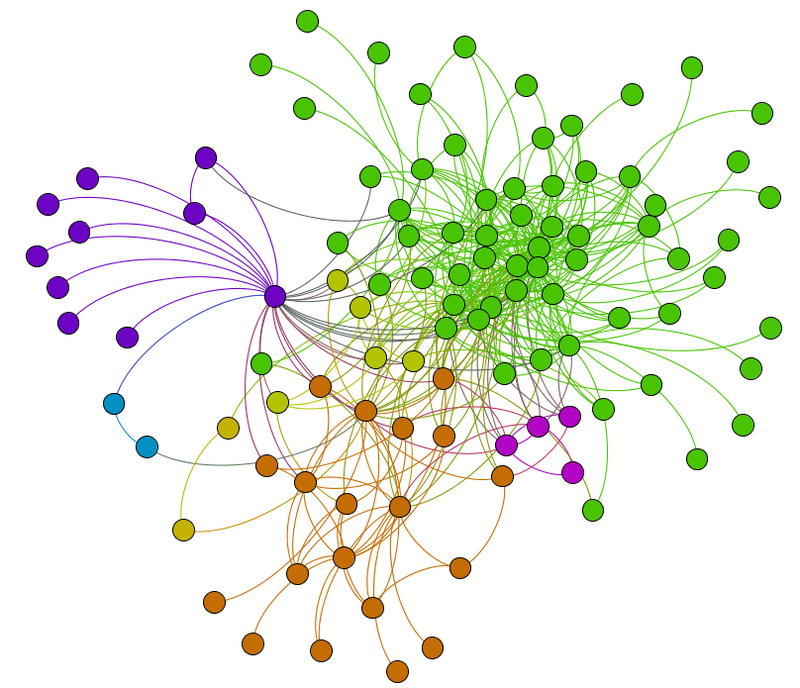 Green nodes are users with at least one upvote edge. 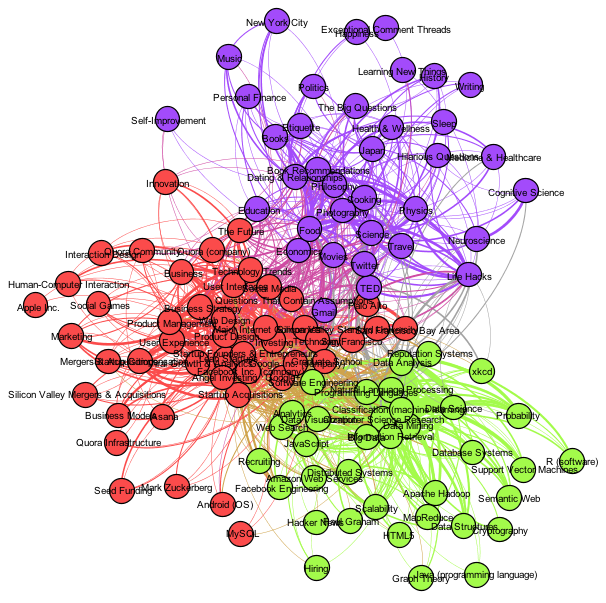 Blue nodes are users who follow at least one of the topics the post is categorized under (i.e., users who probably discovered the answer by themselves). Red nodes are users with no connections and who do not follow any of the post’s topics (i.e, users whose path to the post remain mysterious). Users increase in size when they produce more connections. On Feb 14 (the day I wrote the answer), there’s a flurry of activity. A couple of days later, Tracy Chou gives an upvote, leading to another spike in activity. Then all’s quiet until… bam! Alex Kamil leads to a surge of upvotes, and his upvote finds Ludi Rehak, who starts a small surge of her own. They’re quickly followed by Christian Langreiter, who starts a small revolution among a bunch of machine learning folks a couple days later. Then all is pretty calm again, until a couple months later when… bam! Aditya Sengupta brings in a smashing of his own followers, and his upvote makes its way to Marc Bodnick, who sets off a veritable storm of activity. What differentiates users who sparked spikes of activity from users who didn’t? I don’t believe it’s simply number of followers, as many well-connected upvoters did not lead to cascades of shares. Does authority matter? How far can a post reach? Clearly, the post reached people more than one degree of separation away from me (where one degree of separation is a follower); what does the distribution of degrees look like? Is there any relationship between degree of separation and time of upvote? There are 5 clusters of activity after the initial post, sparked both by power users and less-connected folks. In an interesting cascade of information, some of these sparks led to further spikes in activity as well (as when Aditya Sengupta’s upvote found its way to Marc Bodnick, who set off even more activity). 35% of users made their way to my answer because of someone else’s upvote. Through these connections, the post reached a fair variety of users: 32% of upvoters don’t even follow any of the post’s topics. 77% of upvotes came from users over two weeks after my answer appeared. If we look only at the upvoters who follow at least one of the post’s topics, 33% didn’t see my answer until someone else showed it to them. In other words, a full one-third of people who presumably would have been interested in my post anyways only found it because of their social network. 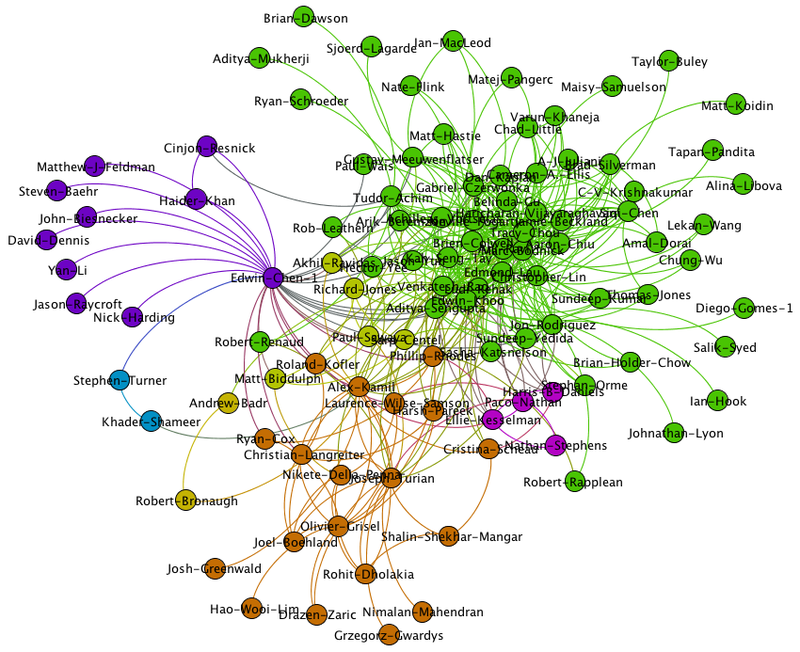 So it looks like the social graph played quite a large part in the post’s propagation, and I’ll end with a big shoutout to Stormy Shippy, who provided an awesome set of scripts I used to collect a lot of this data.